The Gale River rose this morning to nearly level with the road. Yesterday afternoon there were ice dams clogging the river along Route 18 in Franconia. The temperature was 53 degrees. On January 30. In New Hampshire. This morning I dropped two kids at kindergarten and headed with the third to preschool, following the road that skirts the river from Franconia into Sugar Hill. The ice was cleared from the water, dog house-sized chunks of it lining the banks. The preschool is located in an old farm house, just across the road from the river. Three years ago, the low room of the preschool flooded. This morning it looked like it might again. Within moments of our arrival, the water rose and its flow seemed to speed up. Huge blocks of ice churned along with the water. Soon we noticed sturdy tree branches and stumps carried downstream with the ice. The river seemed dangerously close to spilling its banks and creeping across the road. This is about the third time this winter that wildly fluctuating temperatures have made the river freeze, then thaw. Normally we see ice dams only in the spring. This winter, it seems, we notice them almost weekly – clogging the river, then melting in a January heat wave and clearing out again. In the past week we have seen temperatures drop to 20 degrees below zero and rise to more than 50 degrees above. 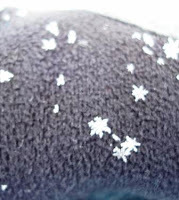 Monday night it snowed nice, light, fluffy flakes that accumulated to a few inches. I’m happy I snuck out to ski Tuesday morning for a few runs, because yesterday it felt like April. Last night it poured. This morning the winter river rose to nearly flood level. This afternoon the wind is howling through the valleys, causing the tall white pines to dance precariously high above the ground, and pushing the cooling air through our old windows. By tomorrow morning, the wind chill should bring the temperature back down to zero. It is supposed to snow. That sounds good to me. More winter, please. I’ll take my spring in April. Through the heart of winter, on Friday afternoons, scores of smiling local children get out of class early to go skiing. For many of the students, these six Fridays are the only opportunity they have in a season to hit the slopes. Skiing kids are happy kids! The contours of Franconia Notch and the winding ski trails of Cannon Mountain are clearly visible from the playground at Lafayette Regional School in Franconia. 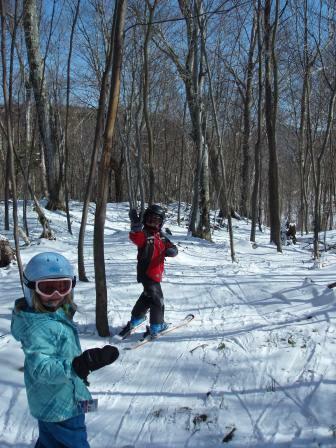 The “Winter Program” at Lafayette – and several similar programs at schools throughout the region – gets kids into the mountains that fill the space just beyond the back yard. Skiing Fridays offer a chilly breath of fresh air in a time when much of the talk surrounding schools focuses on standardized test scores. Some schools might shy away from the idea of students spending precious school hours away from the classroom, focusing on something other than literacy and long division. But this is a mountain town – these are all mountain towns – and if our kids don’t notice and learn about their immediate surroundings, well, they’re missing out. Last Friday I happily joined two of my children for Lafayette’s first Friday ski of the season. The ski day tradition dates back to my husband’s childhood and far beyond, probably to Dow Academy and the earliest days of skiing in the area. Lafayette students have a choice of skiing at Cannon, Nordic skiing at Bretton Woods, or a “winter fun” option which kicked off last week with dog sledding and will move on to ice skating, sledding, and just plain playing in the snow. Eighty of the school’s 108 students opt for downhill skiing. Some are already able skiers when they begin the program in kindergarten or first grade. Others have never skied before. Parents volunteer as chaperones and relish the opportunity to spend Friday afternoons on snow with their children. Some of these moms and dads are learning right along with their kids. “This is a great way for us to not only give back to the local community, with low-priced recreation opportunities, but to earn trust and loyalty over the course of people’s lives up here in the North Country,” says Cannon GM John Devivo, who notes 18 schools participate in some form of weekly ski program at Cannon. As principal Gordie Johnk points out, “how to ski” is not a topic that will appear on any standardized test. But through the Winter Program, students are exposed to new experiences and are learning new skills they may not otherwise acquire. That philosophy extends beyond winter at Lafayette, where every other year the 5th and 6th grade students participate in an “outdoor education” program that includes three or four fall Friday hikes up nearby mountains and an overnight program at the Appalachian Mountain Club’s Highland Center in the spring. These outings are a special bonus to the regular school year curricula. Not every school has one of the country’s most beautiful state parks right out the back door, and at Lafayette the kids get a bit of time to explore that wonderland during school hours. Many of their parents tag along for the adventure, spending time with kids who grow up way too fast, and sharing in their joy of being outside in the mountains. On a school day, to boot. This essay appears in this week's edition of the Record-Littleton.